Cefixime is a 3rd generation broad spectrum oral Cephalosporin. It acts by binding to PBP (Penicillin Binding Protein) receptor namely 1,1a, 1b, 3 and inhibits cell wall synthesis of bacteria. It is bactericidal in nature. 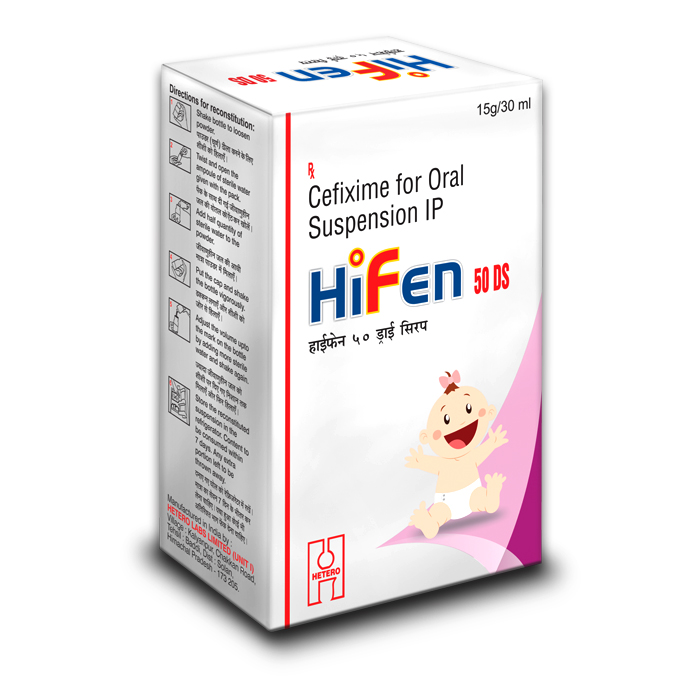 Hifen 50 mg Dry Syrup is used in the treatment of bacterial infections. It is used for short-term treatment of bacterial infections of urinary tract, skin and soft-tissue, ear, bone, blood, abdomen, genital and lungs (pneumonia). It is also used to prevent infections after surgery.